When we lovingly try to become devotees, we gain "Godliness". The duality of the one who devotes oneself, and one who receives the devotion, is gone. "No-mind" has gone to "no-mind". It does not touch the mind. The one to whom we bow, has become ourselves. The observer, that which is observed, and the act of seeing (the observation), are one, and all the distinctions have died. Now, who is God and who is the devotee? Nothing is left. God has lost his identity as God and is now totally permeating in the world without a separate sense of godliness. The duality of God and devotee has been eliminated. Now, immeasurable "Total Freedom" is a servant to him. The bliss of that state cannot be told. Speech has no place there. The sages Narada, Shuka, and many others have become ecstatic because of this bliss. The river-water and the seawater have become one, while the joy of being "united" is extreme. Only one who experiences the sense of the loss of duality can know it for oneself. 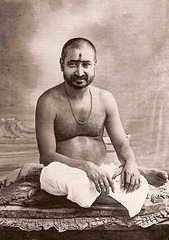 He is the "King of Yogis", and the "Sun of Consciousness" in the human mind. This is the story of Liberation. One who wishes to listen must put his foot down on the head of the mind. You must keep it in check, and verify if what is described is actually part of our Consciousness. Lord Krishna who is separate from Illusion from birth, has liberated even his enemies. He has done extraordinary feats in his incarnation. Being himself the "Totality", he pilfered thing, and he was celibate though he was married and had children. All this is very wonderful. Who can praise Him? Who can describe his greatness?